While at Yale, Casey attended a law school event at which the speaker made an observation that made a lasting impact upon him. “He said law was the instrument of social change in the twentieth century,” Casey explains, “but if you want to change the world in the twenty-first century, get an MBA.” Casey applied, and was accepted into, HBS’ deferred admission 2+2 program, using the two years of work experience to explore options in both social policy and business: the former, through staffing assignments at the Center for American Progress, the Cities of Service Coalition, and Reboot, “a design-based approach to innovation in the public sector,” and the latter through Neiman Marcus, where he worked on the president’s five-year strategic plan. Now in his first year at HBS itself, Casey eagerly describes three key “takeaways” from his MBA experience thus far. “HBS is like a secret garden,” he says. “If you just come in passively, it’s not transformational. But if you dig into the experience, poke around the trees a little, you’ll find extraordinary experiences just waiting to be explored.” As examples, Casey cited his ability to make media connections by poring through the resume book of second-year EC colleagues. When he wanted to know more about consumer goods in Asia, he found an expert on retailing in Japan through the Retail & Luxury Goods Club. 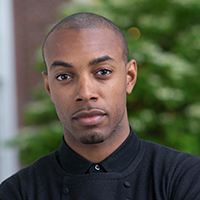 Update: Casey Gerald was elected as the Student Speaker for Class Day 2014. His stirring speech garnered national media attention. According to Fast Company Magazine in a profile on Casey, "Everyone should watch this speech." See it here.